Cook fresh fish or make your favorite hot sandwiches on the Professional Flat Top Griddle. This griddle is easy to cook with and easy to clean because of its restaurant style high sides and convenient grease drain. The added heat diffuser plate distributes heat evenly and minimizes hot spots making the perfect even cooking surface. Preseasoned with Camp Chef's True Seasoned Finish this griddle is ready to use out of the box. Professional Flat Top Griddles Cover for 1 Burner Cook fresh fish or make your favorite hot sandwiches on the Professional Flat Top Griddle. 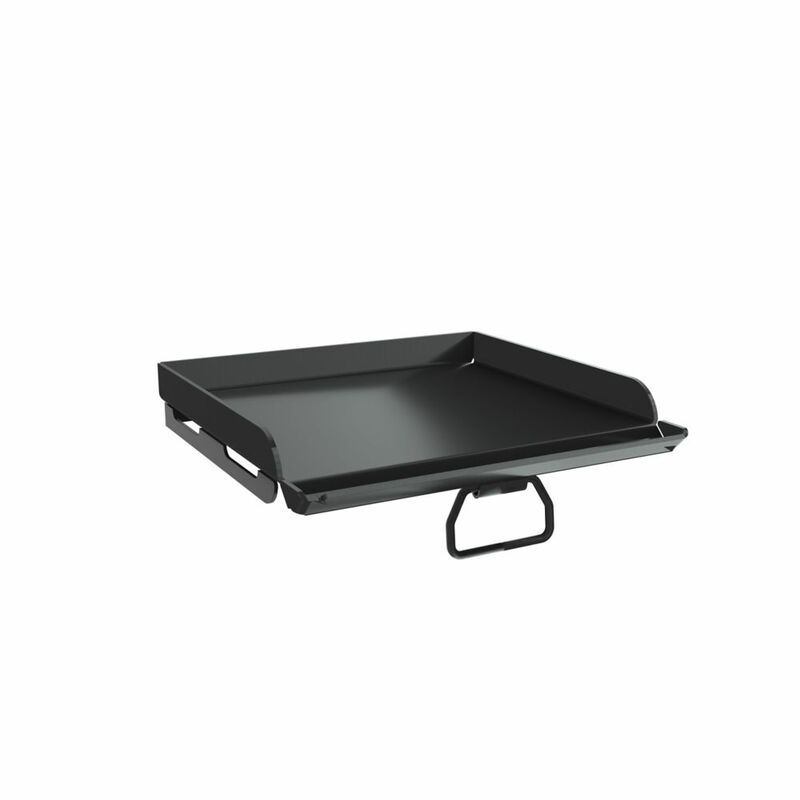 This griddle is easy to cook with and easy to clean because of its restaurant style high sides and convenient grease drain. The added heat diffuser plate distributes heat evenly and minimizes hot spots making the perfect even cooking surface. Preseasoned with Camp Chef's True Seasoned Finish this griddle is ready to use out of the box. Professional Flat Top Griddles Cover for 1 Burner is rated 4.9 out of 5 by 11. Rated 5 out of 5 by Eye Catcher from The camp chef griddle is awesome I bought this a month ago and very happy with it I can cook bacon , sausage and eggs all on one thing. Rated 5 out of 5 by PianoManNY from Excellent Product at a Great Value! I purchased this griddle about a month ago and I have used it several times already for a variety of preparations such as peppers and onions and sausage. I have an older Yukon 60 dual-gas burner stove that still works great! The heating plate on the bottom of the griddle evenly distributes the heat just as it is explained on the web site. This creates an evenly heated surface area for your cooking so that you can count on using the entire grill surface. I only used the medium to low heat settings on my stove just as it is recommended and get great results. Wash with warm water and soap and be sure to apply some oil (veg or Olive) before storing. Would not hesitate in recommending his product. Rated 5 out of 5 by Del W from Great griddle I have used this griddle several times and it is the bomb. Heat distributes very well. Easy clean up. Very well made. I just bought the SG 60. Can’t wait to use it ! Rated 5 out of 5 by Cajtexgm from Just what I was expecting! I only have cooked on this once, but exceptional product. Received, cleaned, oiled and heated. Then cooked pancakes, OMG, no sticking and they turned out beautiful and delicious! Rated 5 out of 5 by Cwby0205 from Outstanding Everything about it is great. Easy to care for also. Rated 5 out of 5 by BenB from Fantastic griddle I bought this 2 years ago to compliment my 2 burner explorer. It is used exclusively for camping and I prefer this over cooking in the travel trailer. Cooking bacon, eggs, pancakes, hashbrowns or anything else I want to throw at this griddle has been a joy to cook. It heats evenly and holds the heat well due to the thickness of the metal. I do keep it seasoned with the Camp Chef cast iron conditioner and store it in a bag while not in use.